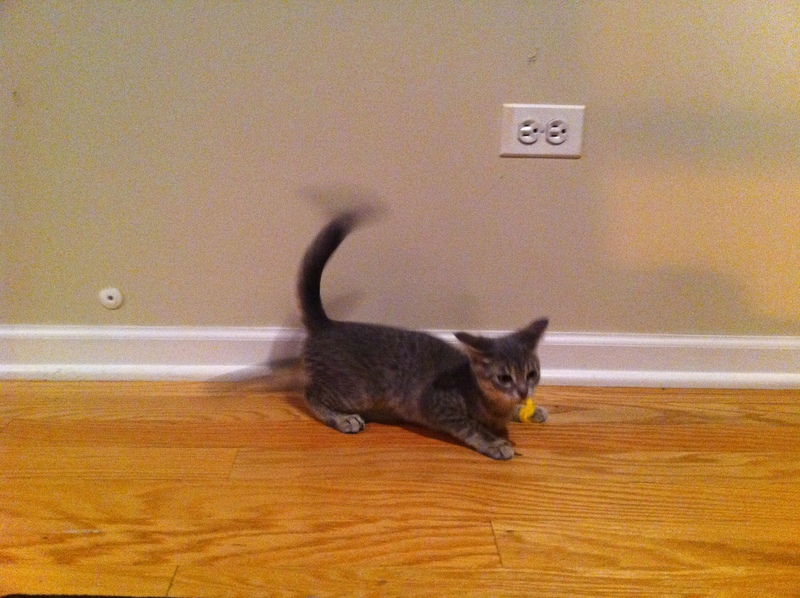 Reader: What Caused My CH Kitten To Become Vestibular For Days Post-Surgery? Every so often, a reader will ask a question that leaves me scratching my head too. At times like those, I like to share their comment, in hopes that another reader out there can offer some advice and food for thought. “I’m a CVT in Tempe, AZ at an 11 doctor practice. I recently adopted a stray kitten with CH that was found in our parking lot. I asked every doctor there if they thought he was healthy enough for a neuter/declaw surgery, everyone agreed he was. His blood work and urine were both normal. While under anesthesia, he did perfectly! He was very consistent with his heart rate, blood pressure, breathing, temperature, and his SP02 was 98-99 throughout the whole procedure. After surgery, he seemed to recover very well, until later on that night when I gave him his pain medication. We gave the dose of oral buprenorphine, and about 5 minutes after he started becoming very vestibular, very freaked out, and “ketamine-like.” He was head-bobbing, disoriented, couldn’t stand, let alone walk, and was rolling around. I called the doctor who did the surgery – he was baffled. I took him to work the next morning so a doctor could evaluate him. He was slightly better, but still disoriented and unable to stand. One of the veterinarians I work with said he has seen some cats get “vestibular” post anesthesia and one that lasted for 3 days. Prior to surgery, he showed very mild signs of CH – he would walk/run with mild wobbling, he wasn’t ever dizzy or disoriented, and he could jump into a litter box and play with the other cats easily. I’m wondering if anyone else has had this reaction with their CH kitty post anesthesia or post pain medication. I’m worried he’ll never get back to his normal state, and he’ll be this vestibular for the rest of his life. The doctors I work with are all split in their predictions – half think he’ll recover and just needs time to get any residual drugs out of his system, and the other half think he may stay this way. From my own experience combined with information from the CH Kitty Club, many of us believe that it is safe to use anesthesia on CH cats. That said, as with all animals with brain conditions, there are some things that need to be taken into consideration during and post-surgery. I learned much of this first-hand, when nearly two years ago, we had Ellie spayed. She came through the surgery perfectly, and seemed like she wanted to rest and relax – until we brought her home. She then turned into a little firecracker – a ball of energy – that was exponentially more wobbly since the anesthesia hadn’t entirely worn off yet. Her moderate CH was amplified by the anesthesia. So, this moderate CH kitten who had a hard time walking without falling to begin with was literally bouncing off everything. We tried to confine her to a room so she could rest, but then she freaked out even more, jumping at the door. I wonder if Lesley’s kitten went through something similar. Ellie’s anesthesia wore off by the next morning or so, but as one of Lesley’s coworkers mentioned, it could take up to a few days. I also can’t help but wonder if some of his behavior changes are also due to the fact that her CH kitty is now declawed. Perhaps he’ll need time to adjust to living without his claws, but that may not be all that’s going on. So, dear readers, if you have declawed your CH cat, did you notice a change in his abilities post surgery? Have you had any experience with buprenorphine? Or other experiences like hers? How did everything turn out? Do you have any advice you can offer? Please share in the comments so we can help Lesley and her little CHer! ← Is It Cerebellar Hypoplasia or Cerebellar Abiotrophy? No real advice, but I think it’s a shame that this CH kitty won’t have his claws. If mine didn’t have claws, there is no way he’d be as mobile as he is today. I have had experience with several CH cats, and none has ever clawed the furniture. Water under the bridge at this point, I know. I hope this little guy gets better soon! I think it’s a real shame about the declaw. I agree that it might make him less mobile, because he no longer has claws to grip things. Even non-CH cats can have issues with their paws after such a surgery. I can’t understand why a vet tech wouldn’t know not to declaw any cat, especially one with CH. But I don’t know about the vestibular problems. My view on declawing is definitely split. On one hand, I totally agree with you guys that we shouldn’t declaw our indoor only kitties (or any kitties) and there are ways to deal with the clawing. But on the other hand, I would rather see a cat be declawed then thrown outside or left at a shelter because they were ruining furniture and the owner couldn’t handle it anymore. Regardless, my other cats all came to me pre-declawed and I only saw it fair that he be declawed as well. Trust me, I went back and forth on declawing him for many, many days before finally coming to this decision. Also, and I know this is common although still an excuse, my husband was very reluctant to keeping him with his claws. His thoughts are-if he’s allowing the cat to live with us, then he would prefer them to be declawed. He doesn’t make the rules of the house, but I do have an obligation to consider his wishes, too. In hindsight, I wish I hadn’t declawed him because it was the only way he will have ever been able to get on our bed, although he has put many rips and tears in the furniture in such a short time of living with us (not that I’m the one who’s very upset about that :/). I would not like this to become a discussion on whether or not declawing is ethically, morally, or conveniently right–but more about why my kitten is neurologically recovering so poorly from anesthesia. He’s adjusting quite well to not having his claws and is getting around perfectly fine now, aside from the neurological signs he’s presenting with. The issue is that he is showing vestibular signs. For instance, when he’s sitting still looking at me and I called his name, he turns his head completely 180 degrees from me. He does the same thing when I play with him with toys. He chases the toy for a short period of time, and then out of nowhere he turns his head backward completely. When he hears sounds, its almost like he can’t tell which direction they are coming from. As previously stated, he was not like this prior to surgery and it is coming up on 2 weeks post with only moderate improvement. Only now do I wish I would have taken better videos of him so I could show everyone the difference in his neurological or motor functions from then to now. I drew blood from him today to again test not only his CBC and chemistries, but also testing him again for FeLV/FIV (which he was previously negative for), and now adding FIP(coronavirus) and toxoplasmosis. The veterinarian who performed the surgery is going to call our lab and speak with a neurologist about Burton’s current status. Hopefully he can shed some light on this unfortunately predicament, or at least say that seeing a neurologist in person would be beneficial. But as always, I would still appreciate hearing advice or ideas from everyone about previous experiences or similar post surgery episodes. PS. I’ve also noticed that he sleeps an awful lot. Is this a typical trait for CH cats, or is this a sign that something else could possibly be going on? (He’s always been a pretty sound sleeper, but lately seems to be even more so.) Just a side note. As you can tell, I would qualify as one of those impatient, neurotic owners who would bring their human child into the clinic with every sneeze… (At least that’s what I’ve been told…..) I try not to be that way, but I just want a plausible theory about my baby! We would be very interested in what you find out and will pray it isn’t FIP as that has been the outcome for some of our members kitties. As Lisa said, my PJ is similar in presentation to this little one. She has not been spayed yet so hers is not related to anesthesia. However, he could have had a reaction to the anesthesia, Just as with humans, animals can be sensitive to almost anything including anesthesia. There is just no way to determine ahead of time if they will have a reaction. I have to say it is encouraging that there has been even a little bit of improvement. Sometimes it can take time for the anesthesia to be processed out of the body. The one thing I would recommend is to determine which kind of anesthsia was used and how it is processed out of the body (liver/kidney/etc). Then see if there is anything you can do to support that specific system to help encourage it to help process out the remaining anesthesia. For kidneys SQ fluids may help to encourage the processing. He may have something underlying that could have been brought to the forfront because of the anesthesia. I feel that PJ’s symptoms became more prevalent after her vaccine. Which she did have a reaction too. As far as your question about sleeping alot both of my CH kids sleep a great deal. They spend so much of their energy to just get around. I do hope he continues to improve. I sure hope that nothing points to FIP. I hate that disease with a passion. Do keep us informed. We are here to support and offer encouragement and not to judge. But being human sometimes we fall short. Hugs and healing energy being sent your way. I’m in the UK, and we generally don’t declaw cats here. I really think the loss of claws will be contributing to your cats increased wobbliness. Both of my CH cats rely on the traction available from claws when playing, moving and climbing onto sofas etc. Our home does look a bit shredded, but I’d rather they have the aid to mobility claws provide. Sorry, I’m not judging you either – I can understand why you’d like him to be on a level playing field with your other cats. I missed seeing the previous comments which make the same point about traction. I hope your vet tests give you some helpful pointers as to what’s happened post-operatively. Sad to Declaw. If more of this happens I suggest a cat behaviorist or a different vet. Most of the blood work results are in, but the FIP and toxo screens are taking a little longer. Everything so far is looking pretty normal. Hopefully the results will be there tomorrow. I’ve been anxiously awaiting for them! As for Burton’s symptoms, he’s still pretty much the same. He did finally jump into one of our “normal” litterboxes last night, so that was very encouraging. He had some trouble jumping out, but he did eventually make it on his own. (We use those Rubbermaid-type tubs with large holes in the lids.) He used them prior to surgery without any problems, so its still sad to see him struggle, but I’m glad he’s able to use them again. He seems to be more social tonight and has been following us around all day. His attitude is as sweet as ever–being very loving and affectionate today. He’s always been like that, though, but I’m glad it didn’t go away post surgery! I feel like I’ve been describing his symptoms in a way that isn’t very clear. He isn’t wobbling around as if it were due to his claws being gone, he more seems to be dizzy or disoriented. For example, when its time to eat and he’s trying to focus on getting to his food dish, he looks at it and wobbles his head around and sometimes goes to the left or right of it as if he’s seeing double. When he is sitting very still, he seems to be able to focus better, but even then sometimes he wobbles his head around. I also feel like if I took a video of him now people may just say that he looks like any other CH kitty, but his symptoms were much, much less exaggerated prior to surgery. Anyway, I appreciate everyone’s input, and thank you all for replying with constructive answers and suggestions! A kitten I am fostering to adopt was spayed a week ago and has all the same issues. Fine the night of and the next day she seemed drunk so to speak. I am a nervous wreck and unfortunately we had to in order to adopt her (not my choice). She was purrfect before this and the vets said she my have has a seizure that night but aren’t sure. They also said it could be that the vet did not give enough oxygen and if this is the case could have caused the complication also. Has anyone heard a definitive answer yet? I wish I could provide more assistance, but I do know that individual cats react individually – not only to anesthesia, but to opiates and opiate-like drugs (like bupo). Maybe it’s related to the drugs, but considering kitty has a brain dysfunction and relies on all areas of the bottoms of his feet to maintain balance, I’d say it far more likely to be related to declawing. I know there is a lot of discussion here on the subject of declawing so I won’t go into any more (I have my own neuro disease and it’s making me dizzy), other than to say that while Lesley may not have connected all the dots when making the decision to declaw, certainly at least one of the vets she works with SHOULD HAVE. If I were her I’d start going to a different clinic immediately, because that is so basic it doesn’t make sense that none of them tried desperately to stop her from having the procedure done. I see the latest comment here from Lesley is about a test related to FIP at the end of January. I don’t know if the vet is sugar-coating things (yet another red flag, if so), but did they tell you there is only one way to definitively diagnose FIP while a cat is alive? It requires invasive surgery with fluid and tissue taken from the abdomen. So if a diagnosis is being made via other means, they are still sort of guessing. There are other (treatable) conditions that can mimic FIP symptoms. I had a kitten with the dry form of FIP and she lived for nearly 8 months after her first hospitalization with ‘fever of unknown origin’. She was HAPPY until the last 12-18 hrs of her life, a day or two after it switched to the wet form – and then she was just really tired..she gently drifted off…they only had to give her the one final injection for her euthanasia. I still miss her. It’s always worth it to walk the path through it with them, always by their side, keeping them happy and distracting them…they’re similar to humans that way. So long as you have a highly qualified vet to care for your kitty throughout the process. Anyway, I hope things worked out okay. I forgot to mention my thought process: Oral liquid or injectable bupo starts taking effect quickly (I think ~15minutes), so within 5 mins a fearless (aka inexperienced) kitten might think they feel better and try to stand or at least put pressure on their paws. The pain meds wouldn’t have taken full effect yet, so the kitten would likely be in agony. I have vestibular migraine and am disabled by the condition – if I don’t have my feet firmly planted when standing, or trying to, I have no ability to balance myself whatsoever. I need walls or furniture within a few feet of me at all times, and my feet feel fine. If I tried to stand and my feet were in agony I would go completely out of whack and become very ill, perhaps for weeks or months. So I’m just translating human vestibular to feline vestibular for anyone who might be interested. So…I’ve just been able to read through the entire comment thread, including Lesley’s last comment about the coronavirus titers and concerns about FIP causing the vestibular aggravation. Firstly, Lesley never mentioned Burton’s temp – fever of unknown origin (not attributable to other things like infection), which may be intermittent but is repeated, is a classic warning sign, as may be a particular kind of “poop” (if kitty appears to be pooping blobs of KY jelly, get thee and s/he to a vet pronto). Not all kitties will have the poop thing, but I think FOUO is very common. How do you even know if your kitten has a fever while at home, since felines hide discomfort and illness so well?!?? My FIP kitten had a fever of almost 107 one night, and she just seemed to be sleeping a little more that day(!). When I got that reading I was shocked and panicked, and we raced to the ER…immediately after I called & told them we were coming, which panicked them, because that is extremely high. I first took her to the vet just because she seemed a little lethargic, and her first FOUO-to-my-knowledge & hospitalization commenced. So in kittens at least, even mild lethargy or extra sleepiness should get your attention. Lesley mentioned Burton being sleepy but no mention of his temp…I think only an Internal Medicine specialist or Neurologist could really answer what to look for in a neuro kitten when it comes to fever, because neuro kittens might present differently with fever. And would fever itself cause the vestibular problems?? Depending on how many FIP cats Lesley & her clinic have worked with, much of this may or may not be known…many vets don’t work much with FIP cats, I assume because they get put down once it’s suspected. My internal medicine specialist hadn’t worked with many FIP cats, and we both did a lot of research because I was keeping & nursing my kitten when needed for as long as the disease would allow and as long as she was enjoying life. Surprisingly, much of the in-depth information on FIP was quite difficult to even find. Anyway, the reason I wanted to write this comment is to say that I don’t know whether FIP would cause vestibular symptoms, but fever might, and I do think that surgery on my FIP kitten is what turned hers from dry to wet. She was on the way to it anyway, but it happened probably within 12-36 hrs after surgery. So, just the stress of the surgery/anesthesia/declaw could put enormous stress on an already neuro kitten, and if he had FIP, it could very likely put it over the top. Sorry, I know this is a CH site, but I dunno, maybe some of this will be useful for someone out there…. I am dealing with the exact same scenario as you did. I also work at a vet hospital and consulted all Drs prior to my cat undergoing her spay/declaw procedure. She had very little CH symptoms prior to surgery but post op was a completely different story. She too was on oral buprenorphine for pain post op. We were all stunned to see her go from very little CH symptoms to not even able to stand, let alone walk! She was immediately taken off the buprenorphine and is now being given Prednisolone 5 mg and Clindacure for 2 wks. The Dr thinks the anesthesia caused her brain to swell and the hopes are the Prednisolone will help bring that down and get her back to “her normal” self. I’m curious as to how things turned out for your kitty? Did he eventually get back to what was normal for him or did he stay like this? This is all pretty scary! I have a kitty with very mild CH symptoms (and is mostly blind in one eye), and would really like to hear what the outcome has been with Lesley’s cat, and how things go for Sherri Adkins’ cat. If I’m interpreting the FIP titer of Lesley’s cat correctly, 1:160 is extremely low for a cat in active FIP so hopefully it didn’t turn out to be FIP. Best wishes, and we’ll keep our fingers and klaws crossed that things turn out well. Well, Lilly is 10 days post op and is able to stand and walk but has a pretty significant head tilt to the left and is sways a lot or will go in circles when first trying to walk. Although her condition is still guarded I am pleased with the improvement she has had thus far. I will keep everyone posted on her condition and hope to hear back from Lesley on how her cat is. Sherri, it’s great to hear that Lily is improving! Did she not have the head tilt and swaying/going in circles prior to surgery? My little guy (Bugs) sways but he’s doing it less the older he gets (he’ll be 2 in September). I found that anything reflective was really hard on him, and he’d stumble and fall over -his symptoms were much worse around even a toilet and sink pedestal because the porcelain was reflective, and he still freaks out if I close the bathroom door (very small bathroom). He’s mostly blind in one eye so that could be contributing, but he used to just fall over if my foot touched him gently on one or the other side, but then he’d just happily start playing with his tail or something. The head tilt in Lily seems potentially a whole other story…. I’m disabled by vertigo myself, and have experienced not being able to walk in the direction I’m intending. Mine is related to migraine tho, and the brain is exceptionally complex and so little is known about it. I’m wondering if she seems tired all the time. Being dizzy or vertiginous would def contribute to that. Do you have neurologist specialty vets in your area, or even internal medicine specialists? I hope things continue to improve! I, too, belive they were born with that extra adorable and sweet gene! Burton is my little shadow and loves to be held. He wraps his paws around my neck and licks my face like a dog haha! And when people come over, he’s first at the door when the doorbell rings and greets everyone as they come in. He’s such a social butterfly! My life would certainly be a little duller without him around! I just love him so much and I’m so glad I adopted him! It was quite a scare post surgery. I had only had him for a month or two and thought that he may no take it through all of his symptoms. It was devastating! But thanks to my vet and the neurologist, Burton is better than ever and living everyday to the fullest! He’s so fun and lovable and always a delight! Lilly had very little symptoms prior to surgery. She swayed when she would first get up to walk but soon after she would take off and run straight as an arrow. Her symptoms became so much worse post-op. She never had the head tilt until after surgery either. The closest specialty hospitals are OSU and Medvet in Columbus which is about 4 1/2 hrs away (which is not a problem in the least! I’m more than happy to take her for a neurological work up!) I am discussing a referral with Lilly’s Dr and we will go from there! Thanks for asking about my CH kitty! Burton is doing great! After contacting the neurologist, we started him on prednisolone as per his advice. Eventually the symptoms got to be less and less, until he was back to his “normal” self. He has adjusted amazingly to being declawed, and again, I didn’t want to do that but it’s the choice we made. He’s learning to jump up on everything and it’s so fun! He’s been such a delight to have around and I wouldn’t trade him for a normal cat ever! He’s the best, most affectionate cat I have and I just love him so much! So glad to hear Burton is doing well! I do not want to sound absolutely horrible but the first thing that hit me before they even mentioned wondering if it was a side effect was that you had put this poor creature thru such a horrible thing. Why on earth declare a cat with balance issue already? Do you not understand that cats carry the majority of Thier weight on those front toes which have now been hacked off? Omg! I am the director of a non profit rescue that works to a large degree with under socialized and special needs kittens and have to say after reading this I am completely appalled that anyone in the VETERINARY field would do such a thing to a kitten who already faces life with special needs! I am very much against the declaw procedure in the first place after making the horrible mistake of having it done to one of my own cats at a young age and seeing how it destroyed the life of a lovable sweet kitten. The procedure itself is hard on any animal let alone one who already had balance issues, do I feel it has an effect on this kitten? Without and Damn question it did! Learn what you are dealing with before you destroy another precious life! 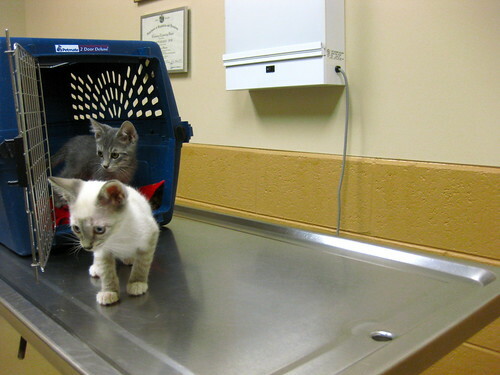 My 2 kittys were spayed at a very nice shelter where we got them. We got them declawed. They were great 10 days after we gave them pain & antibiotic meds but for 3 days now, they r sleeping all the time. Other than that, they r fine. What to do?